On June 21 more than 300 exclusive guests entered the Marquee New York dance and nightclub for the 5th Annual Seed Summer Party, a fundraiser that helps raise money for more than 2,000 students in Senegal, Gambia and the United States participating in the SEED Project. The West African-themed upscale shindig has become one of New York’s premier summer pre-NBA draft events. The West African vibes, food from celebrity chef Pierre Thiam, and an exclusive private auction, were all in the name of fun and philanthropy. The SEED (Sport for Education and Economic Development) Project is an international nongovernmental organization that uses sports, specifically basketball, as a way to identify, cultivate and educate leaders. According to its website, SEED works to maximize student potential in educational activities while emphasizing leadership and social responsibility. The organization is based in Senegal and serves 2,000 youths a year, ages 6 to 19, with boarding and after-school athletic, academic and leadership programs in accordance with the principles of education, life skills and responsible citizenship. NBA vice president and managing director for Africa, Amadou Gallo Fall, said the event fared very well. Since 2002, 92 percent of the Seed Project’s graduates have attended university or secured a job upon leaving the program. Fifty-nine percent of graduates have earned scholarships to attend U.S.-based universities. “At the end of the day, it’s about motivating these young people to have an interest, to take on their responsibility in terms of what they can contribute to the future of Africa,” Fall explained. “I’ve always told them, if Africa’s ever going to have a chance of true development, it has to be able to rely on its youth, which are the biggest asset, more than 65 percent of the population, and it’s only going to get younger in the future. 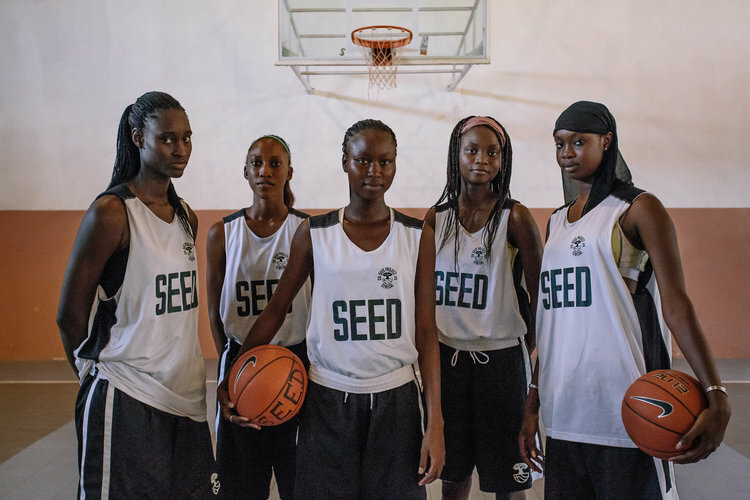 SEED’s mission is really to use basketball to empower and get these young people to focus on their education and learning to be good citizens and having a sense of responsibility towards their community. In May, the NBA and SEED Project announced the official opening of NBA Academy Africa, an elite basketball training center in Thies, Senegal, for the top male and female prospects from throughout Africa. NBA Academy Africa is the first of its kind on the continent. Twelve elite male prospects will be selected following scouting programs conducted with local federations across Africa and elite skills camps hosted in Thies that started in May and will end in December. All 12 prospects will receive scholarships and training at NBA Academy Africa. Besides NBA Academy Africa, the NBA and SEED Project also announced their plan to launch a new NBA Academy Africa facility in Saly, Senegal, for elite male prospects from throughout Africa, scheduled to open in the fall. When the new facility in Saly opens, SEED Project’s facility in Thies will house and train female prospects and younger male prospects. According to a press release, NBA Academy Africa will employ a holistic, 360-degree approach to player development that focuses on education, leadership, character development and life skills. As part of the program, the students will compete against top competition throughout the year and will have an opportunity to be selected for travel teams that play in international tournaments and exhibition games. NBA Academy Africa builds on the NBA’s existing basketball and youth development initiatives in Africa, including Jr. NBA programs for boys and girls ages 16 and under in Cameroon, Congo, Kenya, Morocco, Mozambique, Nigeria, Ivory Coast, Tanzania, Uganda, Senegal and South Africa. Basketball Without Borders (BWB), the NBA and FIBA’s global basketball development and community outreach program, has been held in Africa 14 times, with nine former BWB Africa campers drafted into the NBA. Fall said he feels blessed to see the growth of SEED across Africa. Fall’s journey plays out in the narrative of how the SEED Project began. “It’s really my story, how I stumbled into basketball many, many years ago. I was helped by a generous soul, somebody who was with the Peace Corps who saw me play and helped me get a scholarship to come to the U.S. It opened my eyes to the power of sports, and also opened doors for me to meet unbelievable people along the way,” he said. “I found a career in basketball even after a short college career. I just endeavored from that point on to figure out a way to give back, especially replicating my story and we’re able to do that with number of other young people. Ultimately, we thought coming up with an organization which sole mission would be how to use sports as a conduit to socioeconomic development.